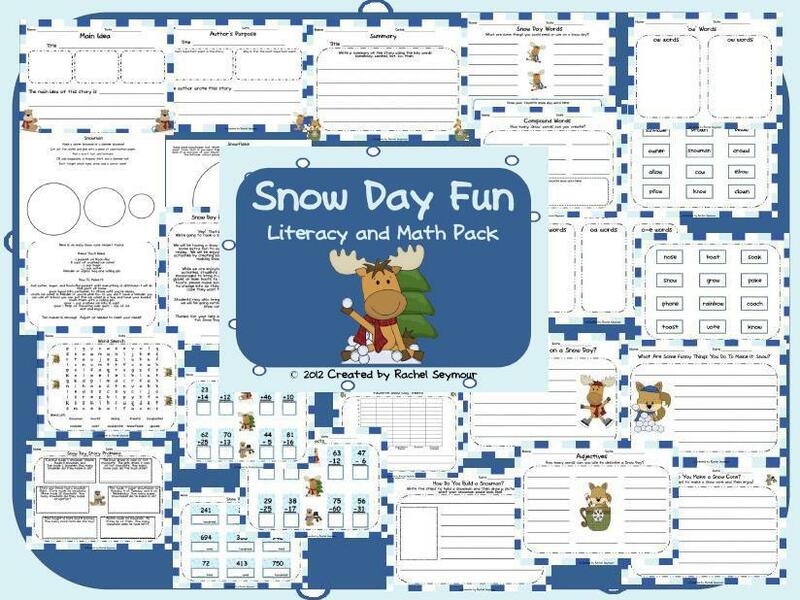 Last year we did not get a snow day and my kiddos were kinda sad about it so at the end of the school year we decided to create our own snow day. They had soooo much fun! It happened in May when the weather was over 80 degrees, but it was a great way to take our minds off the heat. We had a snowball fight, made snow cones, and spent a lot of time reviewing first grade skills. 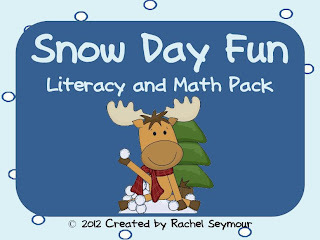 This year I've decided to add to my Snow Day Fun Pack by creating a nonfiction animal fact book and an animal report. My kiddos love making class books. This book they each get to make so they will be so excited to each have their own. I plan on doing this with my kiddos in January this year....or when it finally starts to snow! I've got a snapshot of most of the pages here, but this doesn't include everything. 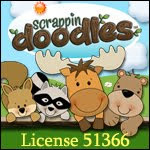 Click here to see a couple new pics at my TpT store. Click on the cover page to go to my TpT store and purchase this pack! Here is a snapshot of most of the pages included in this pack. As with all new and updated TpT items, I will *give away 3* to the first 3 people who leave a comment and an email address. I would love to hear how your day went today. My kiddos never brought up the Connecticut shootings. I was prepared with an activity if they did and I'll hold on to it in case it comes up later this week, but today there was no mention of it in my room. I did tell my kiddos I loved them as they walked out the door. I usually do. Right or wrong I love those kids and I want them to know that. One of the teachers I did my student teaching with told her kiddos she loved them all the time. At first I thought that was kind of strange because they weren't her biological children. I'm so glad she told them that. They needed to hear it, but even more importantly I needed to hear it. I know my students have moms and dads at home, but I can still love them and cherish the time I have with them. I tell my kiddos we are a big family and while we may not always get along and will sometimes need a break from each other we will always love and respect one another. A mom of one of my kiddos came in today to listen to some of my kids read. She's a great mom and we talked for a few minutes when she got there. She started crying immediately. I held up for the first few minutes, but then told her I had to stop because I didn't want the kids to see me crying. I reassured her that we have a plan in place in case of an emergency and that the kids know what to do. We had a police assisted lock-down on Thursday. I'm glad it was before the Connecticut tragedy. I mentioned that I was so happy that all of my kiddos were there today because I expected to have a few out. She said she really wanted her child to be there and not be afraid of school. He assured her that he wasn't afraid. No parent should have to worry that their first grader is afraid to come to school because of violence. I'm glad he feels safe. I hope he always does. I hope he and all of my other students NEVER experience any sort of tragedy suffered by those in Newtown. I hope they continue to love school and feel safe, respected, and loved inside those walls. I promise to do everything I can to make that happen this year. I love my kiddos. I will tell them that every day so there is no doubt that someone loves them. I'm glad my student teacher told her kiddos she loved them. She was right. She did love her students and they absolutely needed to hear it. So did I. Would LOVE this b/c LOVE your stuff:)! Regardless, your unit is on my wishlist now for my January arctic activities.